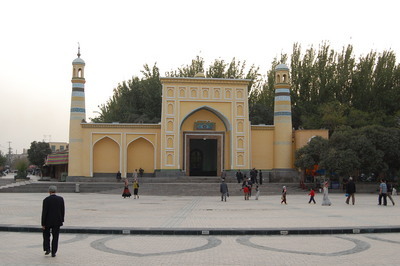 Id Kah Mosque, Kashgar, East Turkestan -- Photograph 2005 Via Wikimedia Commons. China must account for the conditions and whereabouts of Nur Muhammed, a Uyghur handed over to Chinese officials in Thailand on August 6, and five Uyghurs, including a woman and two young children, who were forcibly repatriated to China from Pakistan on August 8. The Chinese government's failure to transparently handle the cases of individuals previously repatriated to China heightens concerns on the part of the Uyghur American Association (UAA) that the fates of Uyghurs deported from Thailand and Pakistan will remain unknown, and that they will be subject to torture, arbitrary detention, and possible execution. Muhammed, who reportedly fled to Thailand two years ago, was deprived of Thai legal guarantees to be brought before a court before being handed over to Chinese officials. At present, it is unclear whether he remains in Thailand or whether he has been repatriated to China. The five Uyghurs deported from Pakistan on August 8, including a woman named Menzire Memet and her young son and daughter, were reportedly blindfolded and handcuffed before being forced onto a flight on a Chinese airline departing from Benazir Bhutto International Airport in Islamabad. Radio Free Asia (RFA) reported that a Uyghur activist in Islamabad believes the five Uyghurs may have been among a group that were on their way from Central Asia to Turkey, where they had hoped to seek asylum. "Simply because they fled from China, the Chinese government has labeled these Uyghurs as criminals, and has outsourced its human rights abuses to other countries. There is no evidence that any of these Uyghurs committed any crimes," said Uyghur American Association president Alim Seytoff. "The only evidence of criminal activity is on the part of the Chinese regime, which continues to order Uyghur deportations in the shadows. Chinese officials deal with Uyghurs with even less transparency when they arrive back in China and are submerged in complete darkness." The deportations of Uyghurs from countries surrounding China signals the Chinese government's increasing ability to use its economic and diplomatic clout to compel other countries to deport Uyghurs and suppress peaceful Uyghur activities, in violation of international law. While intensifying harsh repression domestically, forcing Uyghurs to flee China, the Chinese regime is successfully exporting its repression, enlisting the aid of countries dependent on its investment and geopolitical leverage to deny refuge to Uyghurs. Countries in Central, South and Southeast Asia are increasingly dependent on economic cooperation with China, as China invests heavily in exploiting the natural resources in these countries. The reluctance of countries such as Thailand and Pakistan to forgo the profits and political leverage they gain from China outweighs their concerns about abiding by international and domestic obligations regarding the rights of refugees and asylum seekers. International organizations must work actively to prevent Uyghur asylum seekers from being deported to China, as even the act of applying for asylum itself makes Uyghurs vulnerable to torture and detention upon repatriation to China. The refoulement of Uyghurs who seek asylum or who may wish to seek asylum violates the Refugee Convention, the Convention against Torture and other Cruel, Inhuman or Degrading Treatment or Punishment (Article 3), the Fourth Geneva Convention of 1949 (Art. 45, para. 4), and the International Covenant on Civil and Political Rights (Article 7), in addition to fundamental tenets of international customary law. As in the case of 20 Uyghurs deported from Cambodia to China in December 2009, when Cambodian foreign affairs officials proclaimed that the Uyghurs had "illegally entered" the country, Thai officials charged Muhammed with "illegal entry" under Thailand's Immigration Act. In both cases, officials in Cambodia and Thailand failed to fully investigate the reasons why the Uyghurs had fled China before handing them over to Chinese officials, in spite of international law. Chinese officials promised transparency in the legal procedures used with regard to the 20 Uyghurs returned to China from Cambodia, but have as yet failed to publicize what has become of them since their repatriation. In May 2011, Kazakh authorities handed Uyghur refugee Ershidin Israel over to Chinese officials. Israel had fled East Turkestan after speaking to overseas media about the death of a Uyghur in police custody after July 2009 unrest in the regional capital of Urumchi. According to a Kazakh diplomat interviewed by Reuters, Chinese officials "gave written guarantees that Israel would not be executed" upon his return to China. However, China has failed to deal with Israel's case transparently in the months since his repatriation. Uyghurs have fled China in large numbers since the July 2009 unrest in Urumchi, when security forces cracked down violently on Uyghur protestors. Chinese authorities followed this crackdown with mass arbitrary detentions of Uyghurs. The Chinese government has portrayed the events of July 2009 solely as a criminal act carried out by a small group of violent Uyghurs, ignoring security forces' killings of Uyghur protestors and subsequent "enforced disappearances" of an unknown number of Uyghurs in the city. Chinese authorities have also failed to acknowledge the systemic human rights issues that led Uyghurs to engage in a peaceful protest on the afternoon of July 5, 2009. At least two of the 20 Uyghurs deported from Cambodia reported having witnessed security forces beating and killing Uyghur protestors on July 5. According to the People's Daily, China became Thailand's second largest trade partner after Japan at the end of January 2011. Bilateral trade increased more than 30 percent from 2009 to 2010, reaching 46 billion U.S. dollars. Chinese trade with Pakistan has also deepened in recent years. Xinhua News Agency reported that by the end of 2010, Chinese enterprises had signed contracts with Pakistan valued at 19.87 billion U.S. dollars. Citing figures from the Chinese Commerce Ministry, Xinhua stated that China's direct investment in Pakistan had reached 1.36 billion dollars, while Pakistan's investment in China had reached 57.38 million dollars. Pakistan has a documented history of deporting Uyghurs to China. For instance, Pakistan authorities reportedly deported a group of Uyghurs in 2009. At that time, nine Uyghurs were refouled to China after being accused of terrorism. According to Pakistani media reports, the handover of the nine men came about as a result of three agreements made between Pakistan and China regarding militancy and extremism. However, UAA urges caution when viewing allegations of terrorism among Uyghurs in Pakistan, in light of Pakistani authorities' close cooperation with the Chinese government in its persecution of Pakistani-based Uyghurs' peaceful activities. Pakistan also sought to respond quickly to unsubstantiated Chinese allegations of Uyghur terrorist activity on Pakistani soil, in the wake of recent unrest in the cities of Kashgar and Hotan in East Turkestan. Pakistan hurriedly dispatched the head of its Inter-Services Intelligence to Beijing to smooth bilateral relations. Chinese government authorities consistently fail to provide corroborating evidence for terror claims made against Uyghur individuals, and evidence that is cited is not made available for public scrutiny. UAA urges the international community to view Chinese government accounts regarding Uyghur terrorist acts with caution, as government authorities consistently fail to provide evidence to substantiate their claims. Many observers, including Sean Roberts and Human Rights Watch, have argued convincingly that claims regarding terrorism have been used to deflect international criticism of egregious human rights abuses in East Turkestan.